Martha writes that she is pleased with the fabric sent for the chair and sofa, but is having trouble finding tacks small enough. She asks that some be sent to her based on the sample she is providing. 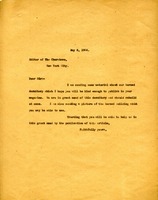 decorating, MB, W.E. 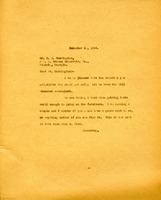 Browne Decorating Co.
Miss Berry sends material to the editor about the burned dormitory along with a picture and hopes they will be able to help. Miss Berry informs Dr. Payne that she cannot speak at the Conference on Adult Education because of a severe cold. Professor G. Leland Green, Principal of the Berry Schools, will take her place. 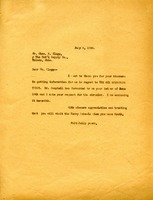 A letter asking for a donation of one hundred and fifty dollars from Mrs. Colgate. 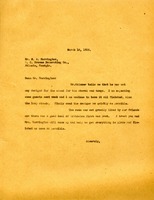 In this letter Martha Berry asks Mr. and Mrs. Harrington to come up on Saturday and bring up something to cover her chairs. 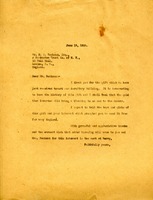 Martha Berry requests a donation of $150 for the Berry Schools. 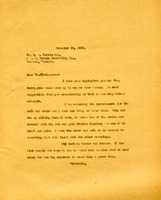 Martha Berry asks that Mr. Harrington send designs for the stand and lamp she has ordered as soon as possible. She hopes that he and Mrs. Harrington will come to help finish a room as friends who visited recently were critical of it. 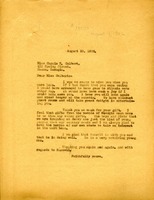 Letter from Martha Berry thanking a friend for leading her to an acquaintance of his who could provide furniture for a living room in the girl's dorm. She suggests that he send a table pattern for copying by one of the boys in the shop. 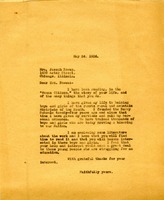 A letter from Martha Berry explaining what she has done for the boys and girls of Berry, while also enclosing some literature about the work to Mrs. Bowen. 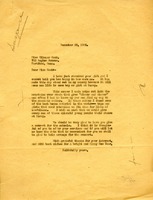 Berry thanks singer Ellenor Cook for her gift and discusses a proposed concert by Miss Cook at the school. 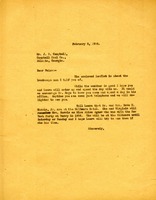 Martha Berry writes George Burns to let him know that the $2 left in her car has been turned in and credited to general expenses. She mentions his recent trip to Berry and hopes that he and their friends are not worn out from the visit. 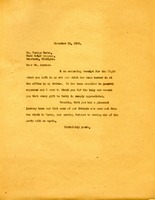 Letter of regret for missing Miss Carrie F. Colbert's visit to make her feel important. Thanks her for her gift. 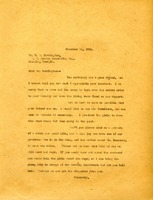 A letter from Martha Berry inviting the Campbell's to come visit the campus and Mr. Hoge. 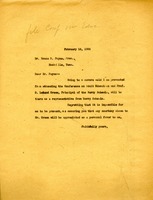 Miss Berry writes to thank Mr. Clapp for giving her information on The Oil Operators Trust and encloses the circular he requested.